During Fair Break, the 7th & 8th Girls Volleyball teams participated in the Mid-State League Tournament. 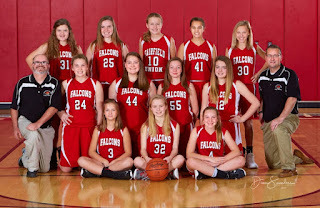 While the 7th Grade team got knocked out of the tournament in the first round in a loss to Bloom Carroll, the 8th Grade team defeated Circleville and Teay Valley East in the first two rounds of the tournament to qualify to play in the championship match that was held last Wednesday. The 8th Grade team faced off against Hamilton Township, the only team to beat them in the regular season. In the first game of the match, the Lady Falcons barely lost 23-25, but they came storming back in the next 2 games to win 25-22 & 25-20, winning the outright Mid-State Championship in back-to-back fashion! Congratulations to both teams for a great season and thank you to all the fans that supported them. Varsity volleyball defeated Teays Valley 3-1. Katherine Qualls had a season high 13 kills and Braidyn Reed had 8 kills. Qualls also added 7 aces on the match. Defensive effort was led by the huge blocks of Joey Burke with 9 and Jess Cottrill 7 more. Thank you to all the fans that came out last night to the 7th & 8th Grade Volleyball teams’ last home match of the season where the Lady Falcons hosted Liberty Union in a Red-out. The 7th Grade team fought until the end of both sets, but lost to Liberty Union in 2 games. The 8th Grade team faced tough opposition, but destroyed Liberty Union in 2 games to end the regular season with a 12-2 record. Both 7th & 8th Grade teams will travel tomorrow (Saturday) to start their runs for an MSL Championship, which, if they qualify will be on Wednesday October 11th. Tomorrow, the 7th Grade team will compete at Teays Valley East Middle School and the 8th Grade team will be at McDowell Middle School in Logan Elm. JV volleyball team defeated Hamilton Township 2-0. Offensively Olivia Spillers had 5 kills and Olivia Mahler chipped in 4 kills. Lilli Young and Marisa Mahler each added 3 aces and terrific serve receive. Varsity volleyball team lost to Hamilton Township in a tough match 0-3. The volleyball team would like thank the students who came out to support us on senior night. The 7th & 8th grade girls volleyball teams travelled to a hostile and loud environment at Circleville Middle School last night. The 7th Grade team fought long and hard, but lost in 2 sets, while the 8th Grade team punished Circleville’s 8th Grade team, winning in 2 impressive sets. The Lady Falcons have their last home match, which is also the last match of the regular season before tournament time this Thursday when they host Liberty Union. We’re calling for a Red-Out for the game, so we need all of our loud and crazy fans there wearing red and cheering the Lady Falcons on to victory! JV volleyball team defeated Amanda Clearcreek 2-0. Alaina Berkfield had 15 service points and 5 aces. Madalynn Wagner had 6 kills and Olivia Mahler had 5 kills. The varsity volleyball team defeated Amanda Clearcreek 3-0. Setter Rylee Barr led the offense with 14 assists. Joey Burke and Vada Young each chipped in 8 kills. Congratulations to the JV volleyball team with a big win over Logan Elm. Madalyn Wagner led the offense with 5 kills, and Hannah Mahler had 11 serving points including 5 aces. 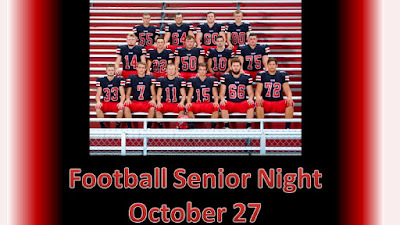 The win takes the Falcon's to a 7-2 record in the MSL. The 7th & 8th Grade girls volleyball teams travelled to Hamilton Township last night where the 7th Grade girls fought through a tough opponent and won in 2 games. The 8th Grade team lost to Hamilton in 2 games. The Lady Falcons host Amanda Clearcreek tonight and we need our fans to show up in a big way for this match tonight and white out the gym and cheer the Falcons on to victory! JV Volleyball team defeated Bloom Carroll 2-0 in a terrific effort. Varsity Volleyball team defeated Bloom Carroll 3-0 in great team win. The volleyball team would like to thank the students and staff who supported our efforts. Special thanks to Mrs. McClure-Spillers and FCCLA members for all their time and effort. The 7th & 8th Grade volleyball teams hosted Teays Valley East last night. The 7th Grade team lost in 2 games while 8th Grade team won in 2 close games. The Middle School volleyball teams will be attending the Volley for a Cure event tonight at the high school, JV starts at 6pm - wear your Volley for a Cure shirts to get in free. The Lady Falcons next match is Wednesday, traveling to Hamilton Township then then will host Amanda Clearcreek on Thursday. Wear white on Thursday for a white-out! . The Falcon JV volleyball team defeated Liberty Union 2-0. The Falcons were led by Madalyn Wagner with 4 kills, Lilli Young with 4 aces and the terrific passing of Marisa Mahler. The Falcon varsity volleyball team defeated Liberty Union 3-1 in a great match. The Falcon offense was led by Morgan Hartman and Vada Young with 11 kills each. Setters Rylee Barr and Mailyn Sunkle chipped 24 and 17 assists respectfully. Defensively they were led by libero Shayla Munyan with 11 digs, and the big block of Braidyn Reed and Joey Burke with 4 blocks each. The volleyball team travels Frankfort tomorrow to take on Bishop Ready and Adena. The volleyball team will return home on Tuesday for the Volley for the Cure match versus Bloom Carroll. Make sure to buy your Volley for the Cure T-shirt at lunch or buy raffle tickets from an FCCLA member to get into the match for free. The 7th & 8th Grade volleyball teams hosted Logan Elm last night. Both teams made it a short night by beating Logan Elm's teams in 2 games. The Lady Falcons host another match tonight, facing off against a non-league opponent, Lancaster General Sherman. JV Volleyball defeated Amanda Clearcreek 2-0. Led by great serve receive from Marisa Mahler, Lilli Young and Olivia Spillers. Varsity Volleyball defeated Amanda Clearcreek 3-0. The Falcon offense was led by Kathryn Qualls and Vada Young with 8 kills a piece, and setter Rylee Barr with 14 assists. Defensively the team was led by their big block, Joey Burke led the front row unit with 5 blocks. The volleyball team would like to thank the golf team and all the students who came out to support them. The 7th & 8th grade volleyball teams travelled to Bloom Carroll last night where the 7th grade team lost in 2 sets and the 8th grade team won in 2 sets. The volleyball teams will host Logan Elm on Monday, September 18th. Come out and support your girls! JV volleyball defeated Johnstown 2-1. The Falcon's offensive leaders were Madalynn Wagner with 6 kills and Brittany Devall with 5 kills. The 7th & 8th Grade girls volleyball teams travelled to Liberty Union last night where the 7th Grade team faced a very tough LU team and lost in 3 very close games. The 8th Grade girls thumped LU in 2 blowout games. The volleyball teams travel again this week on Wednesday to Bloom Carroll to start the 2nd half of the season. JV volleyball team beat Hamilton Township decisively 2-0. The 7th Grade and 8th Grade girls volleyball teams hosted Circleville last night where the Falcon faithful fans showed up for a Black-out student section. The 7th Grade team lost in 3 very close games to Circleville, while the 8th Grade team swept Circleville in 2 blowout games. The volleyball teams travel to Liberty Union on Monday. The 7th grade and 8th grade girls volleyball teams traveled to Amanda Clearcreek last night where both teams easily dominated the Aces and quickly won their matches in 2 games each. 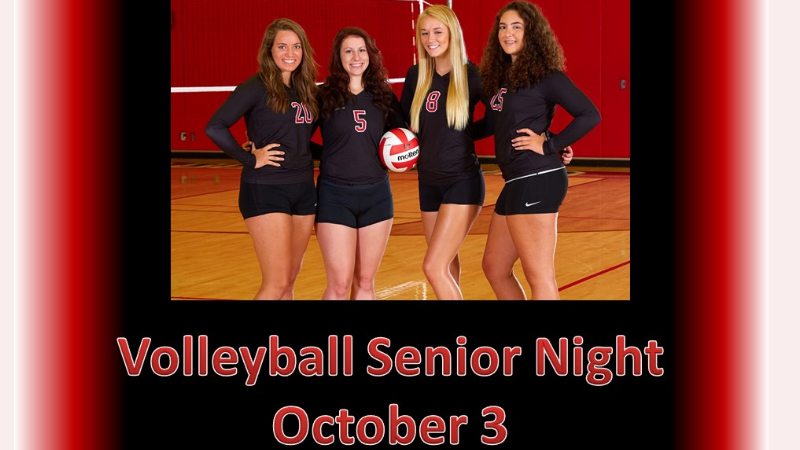 The volleyball teams will host Circleville tomorrow night at 5 pm; come out and support the girls! Varsity volleyball defeated Heath 3-1. Varsity volleyball team lost in a tough match to Sheridan 2-1, but bounced back to defeat Miami Trace 2-1. The JV team defeated Sheridan 2-1, and followed that win with a 2-0 win over Miami Trace. 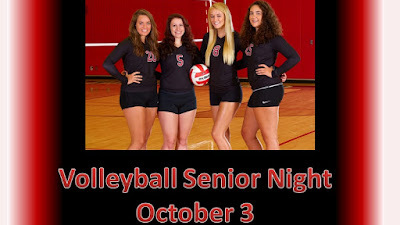 The volleyball team resumes play tomorrow night at Heath. The JV match will begin at 5:30.